I was lucky enough to be at home in Egypt during the revolution. I was planning to come back to the USA on the 18th of January, but I forgot a document during my interview in the embassy, which delayed me for another 5 weeks during which all these events happened. 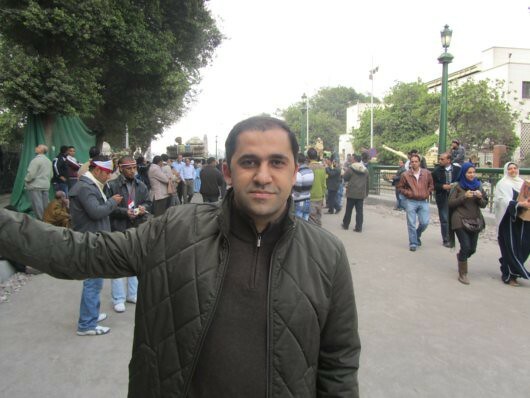 The author, Hossam El-Asrag, in Tahrir Square. El-Asrag is a PhD Student in the MIT Department of Aeronautics and Astronautics. I remember sitting with my father, staring at the TV with mixed emotions — surprise, excitement, fear, happiness and disbelief at what was really happening. Things started to look serious on Friday the 28th, when all the police officers disappeared from the streets, and news broke that most of the prisoners had escaped and were out in the streets, and police properties and stations were burning. Until the end of this day, Mubarak had been completely silent and absent form the public scene. When he showed up on TV, he gave a very short speech, declaring that he had decided to have a vice president and change the government. I looked into Mubarak’s face during the speech. He seemed tired, old and unorganized, but yet collected and showing at least that he is in control. But in my opinion, it was this speech that ignited the revolution — when the Egyptian people knew for sure that they could achieve what they want by being persistent and willing to pay the price of freedom. Over the past thirty years, the people of Egypt have continuously asked for a vice president by all means available to them, and Mubarak refused to even talk about it. Then in 3 days, he just decided to do it. From that day on, all Egyptians knew that it was time to change and fix it once and for all. Eleven days later Mubarak stepped down and the Army took control. The revolutionary wave showed the real essence of Egyptians. When the prisons was open wide and the police disappeared, nearly all the Egyptian youth and middle-aged people came together in self-defense, in organized groups to protect the streets and the homes. This act that showed a highly modern and civilized behavior of these people. During this time not a single sectarian act was committed, the churches were safe, and people seem to depend solely on themselves and on their confidence in one another. Time passed and the revolution broke out, proving how wrong not only Michael Slackman was, but also the majority of western media, and all the people who described the Egyptian character as politically inactive. They ignored the fact the Egypt had the first known organized government in history. Last year I was talking to a professor at MIT in the Math Department, and surprisingly he mentioned the Egyptian army. He told me that the army was on the side of Mubarak, and that was why he was protected. I told him that he was wrong, that the Army stands only beside the Egyptian people. Again, time proved how right my confidence was in our blessed Army. Before I returned to the United States, I felt that the young people had real determination to continue what they started. They kept protesting every Friday, expressing their political requests for reformation. The Army responded by putting most of the corruption figures in jail and changed the government that Mubarak had recently chosen, before he stepped down. The reformation is still in progress and it will take time. I think that in the next couple of years, the rate of success will depend on some sacrifices from the Egyptians and possibly hard times until the economy is built up again on strong foundations. Time might not be on our side, but the braveness and persistence of the Egyptian people will be the real key for a new democratic era that is full of justice and prosperity. Hossam El-Asrag, a PhD Student in the MIT Department of Aeronautics and Astronautics, was at home in Egypt during the revolution. I appreciate the spirit of Egyptians during this revolution and I hope that it will continue until the reforms are done. I really impressed with your article you have pen down the situation very well. It is good work and keep it up. Best Wishes for u and for the people of Egypt. “I wish I were their during the revolution”. All the Egyptian people who were outside Egypt that time said that. I am of curse one of them. What “Michael Slackman ” and the MIT professor said was due to a lake of knowledge about the Egyptian personality. They and all western media , should reconsider and rebuild their ideas after what happened in the 25th of January revolution. Have you ever seen people who clean up after their revolution? I think this is new and unique and you may find it only in Egypt. The next period of time will show them that Egyptian people are political more than politicians. Hossam, Thank you for offering an intimate and personal voice to the revolution. How life-affirming it must have been for you. I think that the comment from Slackman not only shows lack of knowledge about the Egyptian personality, but lack of knowledge about protest and revolution, in general. What protest is not about “bread”? Is it possible to separate economics from politics? Revolutions are about injustice and economic injustices are not to be discounted. “Bread” is more than money. “Bread” is a right to livelihood. If there is no viable sustenance in the society, we might see this as a symptom of political failure. Nevertheless, journalists say things like this because it gets reactions and ‘hits.’ I doubt Slackman’s comments come from any deeply held belief or opinion. Hossam: Thank you for your story. It is so hard to make sense of the news, especially for someone like me who has never been to Eqypt or the Middle East. Your first-hand perspective helped me a lot. It was interesting that you identified Mubarak’s speech as a turning point in the revolution. I am wondering if or how this can be compared to Bashar’s recent speech in Syria. Dear Dr. Usama, Amy and Shaker: I would like to Thank you all for your support and encouragement. It is really an exciting time for me and for Egypt! Alexa: I think the situation in Syria will have slower Dynamics than Egypt even after Bashar’s recent speech. The numbers in the street and the progress of events are different and it will be harder to break the government and police control over the country. The army situation is also not clear in Syria. But overall i think it is going in the right direction. Sadly there will be sacrifices but freedom usually have high price anyway.